2004 Upper Deck Golf returns to the fairways, sand traps and greens around the country with a 132-card set featuring all of last year's best moments and a national sweepstakes whereby golf enthusiasts can win an invitation to a clinic hosted by Tiger Woods. For the third consecutive year, Upper Deck will pair up with Tiger Woods to bring golf fans and collectors together for a unique once-in-a-lifetime experience. This year, 10 collectors who find the Tiger Woods Golden Ball Marker card will be given an opportunity to learn and enhance their golf skills from the number one ranked male golfer in the world -- Tiger Woods. No need to fret if you don't find the Tiger Golden Ball Marker card -- consumers successfully discovering the secret Tiger Silver Ball Marker bounty card can redeem it for $1,000. There are 20 total Tiger Silver Ball Marker bounty cards. "Golf enthusiasts are always clamoring for ways to get closer to the action on the greens," said Bruce Schragin, director of marketing at Upper Deck. "The Go For the Gold Sweepstakes is a perfect example of Upper Deck and Tiger Woods commitment to introduce the game of golf and sports card collecting in fun and interactive ways to fans." Schragin added, "We continue to show a category leadership position in our industry by creating and producing the best collecting experience available and for partnering with the top players in all major sports such as Annika, Tiger, Ichiro and LeBron to represent our brands." Sweepstakes winners will be announced in late September. All winners will receive round-trip airfare to Orlando, hotel accommodations and memorabilia from their special experience with Woods. The event will take place Oct. 18, 2004. For more information on this sweepstakes and the Upper Deck Company, visit www.upperdeck.com. Collectors and fans alike will enjoy the beautifully-photographed cards capturing Annika Sorenstam's play at the Bank of America Colonial, Tiger winning back-to-back WGC -- Accenture Match Play Championships, or Mike Weir surprising the field to earn his first Master's Championship. 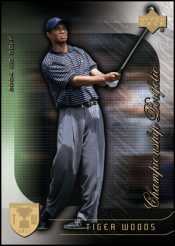 2004 Upper Deck Golf is available now at retail and hobby stores nationwide. Additionally, the 2004 Upper Deck Golf product sold in hobby stores nationwide will boast an extraordinary first for the sports collectibles industry -- each box will contain one golf ball exclusively manufactured for and used by the game's greatest golfers, Tiger Woods and Annika Sorenstam. These rare golf balls are not sold in stores and can only be found in the hobby version.